I worked ornamental iron for 15 years in my youth; it makes an excellent grouding in shop work and installation. Welcome aboard castewart, glad to have you. If you put your general location in the header you might be surprised how many members live within visiting distance. How much do you have to invest in a gas forge? Good is NOT cheap but Okay and Adequate are reasonable where commercial propane forges are concerned. 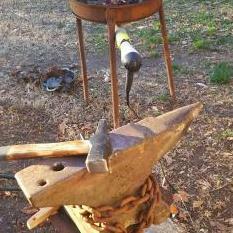 If you have basic shop skills and basic tools you can build a propane forge to suit for reasonable. If you're good scrounging and have good PR skills you can build one for pretty darned cheap. Propane forges and burners are commonly discussed subjects here. Do some skimming through the, "Burners 101" and "Forges 101" subjects. If you skim the thread titles and skim the post titles when you find one that interests you you won't have to spend a few days reading them all. Take notes including the names of folk who know what they're talking about. It'll take some reading to develop a handle on things so you can sort through them for stuff to read and ask questions about. Make sense? I'm not trying to tell you not to bother us but virtually anything you want to know has probably been answered many times. We love good questions and you want to understand what folk tell you without having to have it explained word for word. Yes? Frosty The Lucky.